Andrew and Hank met at Folk Alliance International 2008 in Memphis, Tennessee, as they stepped on stage from opposite sides to accompany the late Tasmaniana devil Audrey Auld. They had never seen each other, let alone ever played a note of music together. Little did they suspect how well this was going to work. In April 2015 Hank put together their first billing as !AH HA!. From the first count-off they had too much fun to turn back, and that was that. This is a match made in musical heaven, a mix of masters where casually elegant musicianship supports grooves under lyrics that will not dull one’s mind. This is contemporary acoustic folk rock of a high order. Andrew Hardin is renowned for his work with Tom Russell, Katy Moffatt, Audrey Auld, Jimmy LaFave, Eliza Gilkyson, Malcolm Holcombe, Joel Guzman, John Fullbright, with Jeannie Burns as Hardin Burns, and many other artists worldwide. Following a quarter-century supporting Tom Russell Andrew set upon his own songwriting, while maintaining select touring and support dates. He has five albums of his own, including two of instrumentals, with more on the way. 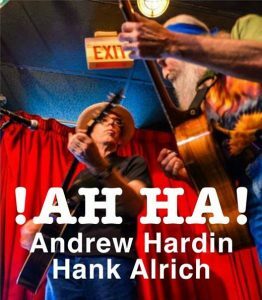 Hank Alrich is little known outside of a small circle of friends, and the Central Texas music scene that he helped nurture during his tenure at Armadillo World Headquarters, the concert venue that put Austin on the international live music map. Which is to say he is a minor legend around Austin TX musical old-timers and younger historians. For the last thirty-plus years he has been living next to the middle of nowhere outside of a small town in the northern California Sierra Nevada, raising a family, writing songs, and playing professionally near home. Hank now splits his time between his mountain home and Texas, again enjoying immersion in the Austin music scene. He is a versatile guitarist and composer, a compelling singer, and a very engaging performer. 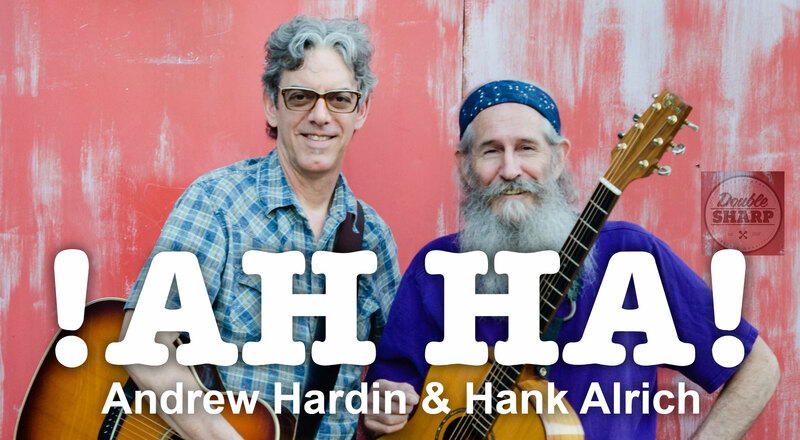 Please provide information about your venue ~ name, location, size, compensation offered, a URL ~ and the date or range of dates for which you would like Andrew and Hank to perform. !AH HA! is a fully implemented, time tested, highway proven product, graceful, powerful and compact, suitable for many musical settings both public and private. Engage at your own risk. Don’t delay. Seize the day! They ain’t gettin’ any younger, and neither are you.